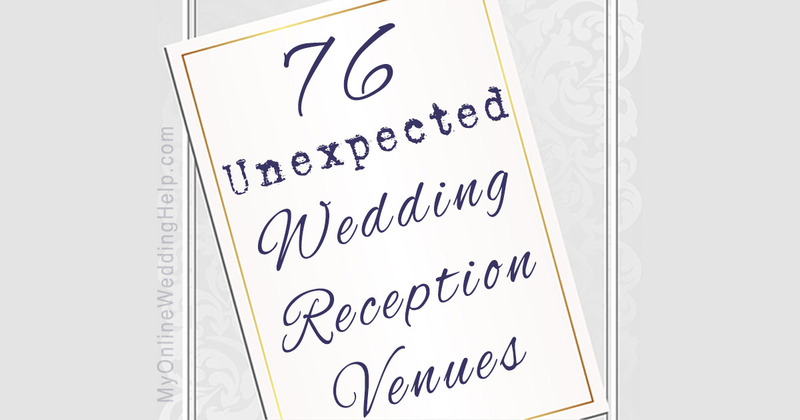 Once upon a time, meeting halls and ballrooms were the most obvious locations for wedding receptions. Not anymore. Today’s non-traditional wedding venues often have a deeper meaning. This contributes toward making your wedding memories even more special. Any area with a large enough space is a contender, so think creatively. As a bonus, these venues are often cheaper than the traditional alternatives. But not always. Many times, they will require extras that the all-inclusive locations do not. For that reason, it’s important to include all expenses when comparing costs. Also, if yours is a location that does not usually host catered events, do an informal walkthrough as part of the planning process. Mentally go through the steps of setting up for the reception and focus on the services you need for each stage. Check for adequate electrical outlets, sinks with water, refrigeration, etc. Now that you’re prepared to compare, what are your different options? Your wedding is one of the most personal events in your life as a couple. Infuse it with even more meaning by choosing a location with special significance. Your own home or that of family or a friend may be the perfect solution for your wedding. There is no rental cost! Here are some options. Also, consider renting a privately-owned location. Sometimes the owner may already do this. To check Airbnb, first search your location for spaces accommodating 16 guests or more (the max number Airbnb lists). Each host will explain their arrangements in the listing. What better way to highlight your hobby than having the reception at a related location. Nature has crafted some of the most interesting places to have a wedding. Here are some considerations. Certain businesses can provide an interesting backdrop for a wedding. Some will welcome the extra business related to a private event. City, county, or federal facilities are often able to rent out space for private events. Explore these possibilities. Membership DOES have its privileges. So if you belong to a club, went to college, or work in a specialized profession, consider these. Choosing a venue with a lot of visual appeal can add value in two ways. You may save money on decorations, plus gain interesting photo opportunities. If you are having your wedding at a unique venue or have more ideas, comment on the blog post below. I am getting married March 2015 and we will be having our ceremony/reception at the Hall of Flame Firefighter Museum in Phoenox. My fiancee was a firefighter/paramedic for almost 20 yrs. The whole theme is firefighter/paramedic. A back yard is nice, but you should have a tent to prepare for hot/rainy weather. You also need tables and chairs. These items are not cheap to rent.